Price from: $575 - Book now! Welcome to Siem Reap, the provincial capital and gateway to the ancient Angkor temples. Upon arrival, our driver and a tour guide will welcome you at the airport and take you to the hotel to check in. Afterward, meet your guide at the hotel lobby for the short tour briefing followed by the orientation tour by tuk tuk- the typical means of local transportation. It will be a perfect introduction of Siem Reap when you are driven along the main bustling streets, water channel, passing by beautiful pagodas. Disembark at the PsarChass that’s a kind of typical oriental bazaars– Old City Market where you’ll walk around and learn the local art of how to bargain when purchasing items. Proceed further to the most exiting pub street for welcome drink before heading back to your home away from home. Return to the hotel for your breakfast then set back out on a full day temple tour. Starting with Angkor Thom’s imposing South Gate, topped with the four serenely smiling faces of Avalokiteshvara. Next, visit Bayon temple, the Elephant Terrace, the Terrace of the Leper King and Ta Phrom Temple. We will send a tuk-tuk to pick you up from the hotel and transfer to the Cambodia Quad Bike office. After a short introduction on safety, you will head out to the rice fields surrounding Siem Reap. 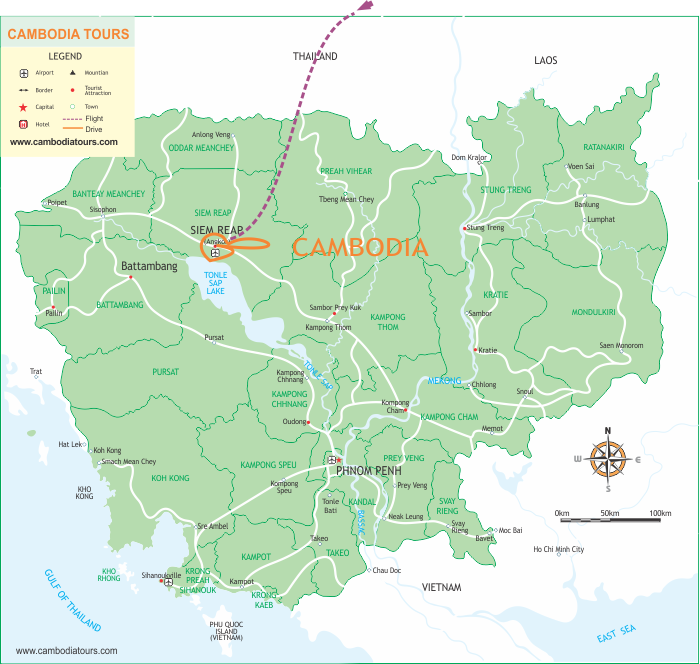 Ride will go past several local villages, where you can see how people live in Cambodian countryside. Our guides will recommend you the best stops for stunning sunset photos. The Angkor Zipline offers you the great adventurous experience. This morning, after having breakfast at hotel, hop on the shuttle bus for a 20 minute transfer to the site where you will take the challenge of a full course (15 trees) with Angkor Zipline. Then, you will leave the park for 1.5-2 hour drive to Kampong Phluk – a floating village on the Tonle Sap- for another adventure. On arrival, you will embark a boat to cruise through the houses on stilts, canals and mangroves forest. It is really unique experience that exposes you to the hardships and tribulations facing the locals on a day to day basis. Accommodation: Homestay in Kampong Khleang. After breakfast, enjoy a cooking class at Homestay with fresh ingredients and a tour around the beautiful Tonle Sap Lake. Your lunch will not only satisfy your empty stomach after a tour around the lake, but also support the education program for local children. In the afternoon, you will leave Kampong Khleang for Siem Reap. This morning, we depart from Siem Reap on the nice over 2 hour drive to visit Beng Mealea, known as “ Pond of Lotus” Temple dated early 11th Century by Suryavarman II as a Hindu Temple. Beng Mealea temple was hidden in a maze of jungle for hundreds of years and recently found and opened for visitors. Climb over large sandstone blocks to reach the inner sanctuary and eerie worship corridor is an exploration to remember. Continue over an hour drive, you will get to Koh Ker, a 10th century capital abandoned in the remote north of Cambodia for more than a thousand years. Enjoy a visit to the pyramid temple of Prasat Thom. Continue to explore the many temples at this incredible site, including the beautiful Prasat Krahom covered by jungle before heading back to Siem Reap later this afternoon. Free for relaxing in Siem Reap until your driver comes to take you to Siem Reap International Airport for your departure flight. - We accept payment by debit/ credit card (Visa, Master, Amex), cash and bank transfer. When you confirm a booking with us, we will send you our online payment link or bank details to deposit 30% of the total tour cost. The balance will be due as soon as you arrive in Cambodia. Our travel consultants will give more details via email about payment instruction.